I know it’s a blog cliche to write about cats. But what about brand new kittens? 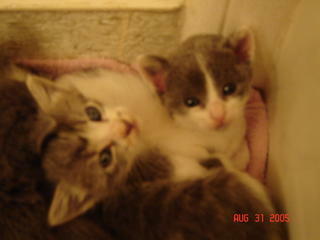 What about brand new kittens who need a home? What about kittens found by television’s Todd Robert Anderson? Sure, other websites promise Kittens From Todd, but do they actually deliver? No. 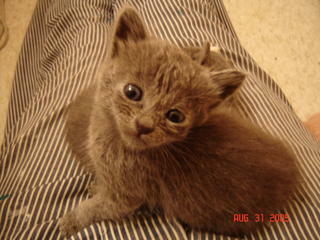 But here at pamie.com, if you want a Todd-cuddled kitten, you got a Todd-cuddled kitten. Click the link and see for yourself. Hello, all you benevolent people who long only to do good! I found a box of 5 kittens next to the road this afternoon, and currently they are residing in our bathroom. I took them to the vet where they were cleaned, given flea medicine and checked for worms, of which they have none. They will need a few more tests in a couple weeks. Hilary and I are not crazy old cat ladies, so we can’t keep them. (We already have two.) However, I don’t want to give them to the pound where I am sure they will be put to sleep. They are too cute for that! (See attached pictures.) Please forward this to everyone you know in Los Angeles so we can find them a home. And if you or anyone you know would like to adopt a wayward kitten, incredibly sweet and innocent and really really cute, please contact us immediately!